Spoiler alert! Breaking news! Bre-X shares don’t do so well in 1997. Click for the site. If you do recent history, you run into problems pretty quickly with archives. Chronic underfunding means that many recent acquisitions sit, awaiting cataloguing. Donor restrictions are often still in place, and – probably most importantly – much of this material is still not archived as it isn’t always thought of as history yet! If you aren’t part of an institution or working at a (well-funded) library, you might not also even be able to access old newspapers: queries get greeted with paywalls, or you have to satisfy yourself with just a free trial. Luckily, by the mid-1990s, Canadians were increasingly online: this is where many chatted, others explored, some panicked (the cyberporn panic of the 1990s! ), and the first traces of our digital past began to be left for all to consume. The Internet Archive’s WayBackMachine lets you go back to the “olden days” of the early internet, from 1996 onwards, and see what was out there. I could talk about the history of the Internet Archive, forever. In a nutshell, by 1996, the significance of the web had been established – but so had some of its disadvantages. Tons of information was coming online, but much of it was transitory: in a 1996 Scientific American article, Brewster Kahle pointed out that the “average lifetime of a document is 75 days and then it is gone.” In June of that year, Kahle announced that he would be officially launching the Internet Archive: inspired by the Great Library of Alexandra, this was a forward looking vision of what future historians would need [link is broken as of January 2013, I’m afraid]. I have been doing a lot of reading on the early Internet Archive, and my breath is constantly taken away at how forward thinking these people were. The realization that this was important and not being kept happened quickly. By 1998, digital preservation was a hot field and one forward thinking person recognized that “historians will look back on this era .. and see a period of very little information. A ‘digital gap’ will span from the beginning of the wide-spread use of the computer until the time we eventually solve this problem. What we’re all trying to do is shorten that gap.” It is probably testament to these thoughts that that quotation can come from a snapshot of Wired.com. So let’s go back to the 20th century, right? But not so fast, tex! You can’t just go back and Google the past. You need to know URLs! To find those, you’ve got to get yourself in the mindframe of an early web user, and that way you’ll find cool things. In this post, let’s go exploring the digital past. Yahoo! Canada as of 8 July 1997. It’s like the Yellow Pages. First of all, you need to go to the WayBackMachine. Go here and type in a URL. Since right now you’re probably only thinking of websites that you use today: Facebook, Twitter, Google, etc., all of which weren’t around in the early web, let’s go to another valuable site. A directory: yahoo.ca. From here, you can start to click around and find neat things on the web that don’t exist today. Things that you wouldn’t necessarily know the URL to go explore. This is sort of like a Yellow Pages (itself a relic): categories, sub categories, taking you right to a page you might want to find. Up above, you’ll see the bar showing how often updates happen. They’re sporadic, but often pick up during major events: after 9/11, for example, there were multiple scrapes of websites like globeandmail.ca to capture the upheaval Canadians were feeling. 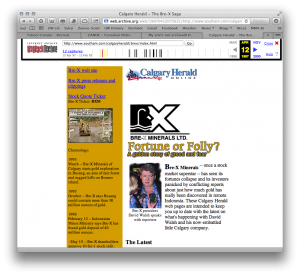 The WayBackMachine’s navigational bar, along the top. The black bars represent snapshots in time. Gaps will appear. A trip to the Canadian Online Explorer (CANOE), one of the main portals, reveals that the URL has been excluded from the archive. Websites can leave a file, robots.txt, to let “web crawlers” – the programs that are indexing your page in Google, or preserving it in the Internet Archive, to leave it alone. This may be the case here. In other cases, the websites simply weren’t preserved. 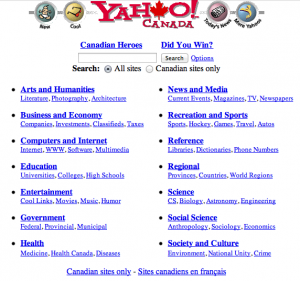 yahoo.ca (link to 8 July 1997) – A great directory of the web, both Canadian and international. This is my starting place for day trips out to the web of the late 1990s. The Canadian only page on the main page is usually broken, BUT in the sub-categories the “Canadian Sites Only” page usually works. National unity, a hot topic in 1997, which sees the inclusion of controversial sites along with places like the Canadian Museum of Civilization. conversation.gc.ca (link to 11 April 1997) – a place where “where Canadians come to share their thoughts, ideas and questions on Canada, with us and with one another — but also a place where people come to find out about Canada,” brought to you by intergovernmental affairs. Enjoy your adventures! If you’ve read this far and want an example of how I’m using such things in my own research, visit my own blog here. Ian Milligan is an assistant professor of Canadian history at the University of Waterloo. If you want to have some more ‘fun,’ you can also read his three-part series of Internet Archive WebARChive files on his own site. Never a dull moment there!